I have quite a backlog of wine reviews to share with you so I am going to get into it without much commentary. I can tell you that the Pinot Noir wines I have sampled from the 2012 vintage, in both California and Oregon, are stunning. 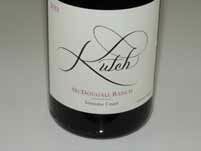 Pinotphiles have plenty to look forward among the 2012 releases in the coming year. Not only are the wines superb, but they are plentiful. 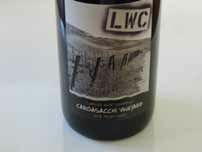 Even the inexpensive bottlings should be very good in 2012. 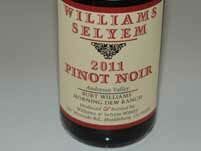 One of your New Year’s resolutions should be to stock your cellar with 2012 PInot Noir. 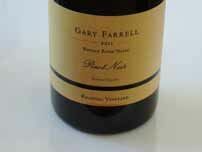 The quality of North American Pinot Noir is now at an all time high. 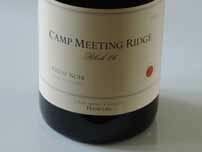 If you are a pinotphile, you are lucky to be living in the age of unrivaled excellence, whether you are primarily seeking wines priced under $35 that are relished for their price value ratio, or collecting the ultrapremium gems where cost reflects the variety’s name: PINO (price is no object). 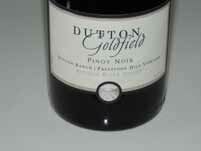 The cold, foggy 2011 vintage produced some very appealing Dutton-Goldfield wines with aromatic brightness, fresh acidity and good complexity. 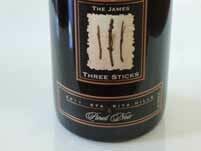 Winemaker Dan Goldfield marks 2013 as his 26th harvest and his experience shows in the high quality of his 2011 vineyard-designated Pinot Noirs. 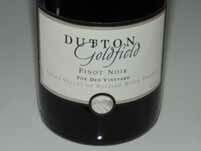 It was Henri Jayer who said, “Good wines are made in a great vintage, but great wines are made in a difficult vintage.” Dutton-Goldfield is one of the most consistent producers currently crafting wine in California, and that includes all the different varietals he offers. All the wines reviewed were impeccably crafted with harmony. 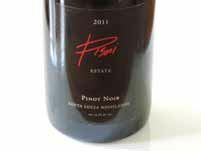 The Pinot Noirs are crafted with de-stemmed grapes, fermented in small open-top fermenters, and cold soaked for 5 to 7 days to gently extract color, spice and fruit characters. 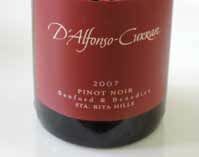 Although the wines are approachable and even enjoyable now, they will benefit greatly from a few years in the cellar. Eeny, meeny, miny, moe - pick any one, you can’t go wrong. Deft winemaking here. Chris and Sarah Pittenger launched the idea of this winery on the banks of the Gros Ventre River in Jackson Hole, Wyoming, where they first met in 2003. Chris spent time as a sommelier and developed his winemaking skills at Biale, Torbreck, Williams Selyem and Marcassin. 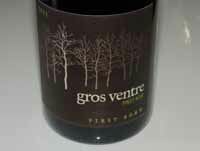 Gros Ventre (gr!vant’) is French for big belly. 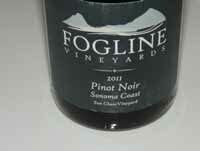 Five Pinot Noirs are produced from four vineyards with a total case production of about 700 cases in 2011. Native fermentations, extended maceration, and no fining or filtering are the rule. Typically the wines spend 3-5 days in cold soak, 2 weeks on the skins, with no extended maceration. They are aged 10 months on lees in 17% to 25% new French oak barrels except the First Born wine which spends 14 to 18 months in 33% to 50% new French oak barrels. Whole cluster is dependent on vintage, clone, block and vineyard. In 2011, Chris held off on whole cluster. 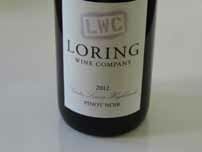 I haven’t tasted wines from siblings Brian and Kimberly Loring recently so it was a pleasant surprise to revisit the latest offerings. 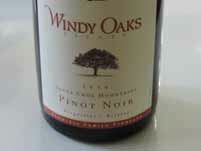 These are bold, full-bodied expressions of Pinot Noir, but the oak is held in check and the tannins are well managed. You will need your big boy pants on when drinking these wines. Both the fall and spring releases were tasted here. We are tired of hearing the words “best ever” when talking about a winery’s offerings, but there is no better way to put it in this case. 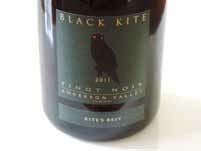 The wines, which are very reasonably priced considering their quality, are sold through a mailing list with some retail distribution. All the wines are 100% de-stemmed and aged about 10 months in 33% new, 33% 1-year-old, and 33% 2-year-old French oak barrels. The wines are bottled unfined and unfiltered. 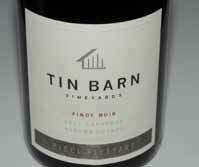 Tin Barn is a specialist in single vineyard wines from Sonoma County. 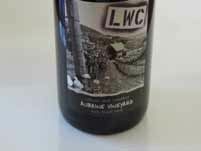 The name of the winery derives from Tin Barn Road that winds along the remote Sonoma Coast to the source of the debut wine, and the fact that the winery is housed in a “tin barn” warehouse in rural Sonoma. 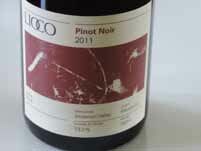 The winemaker and co-owner is Michael Lancaster, a graduate of the University of California at Davis enology program. He acquired winemaking experience at Quail Ridge Cellars and Gloria Ferrer Champagne Cellars before forming a partnership with friends and launching Tin Barn Vineyards in 2000 in a collective known as Eighth Street Wineries in Sonoma. 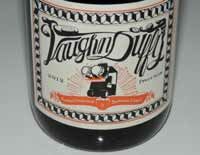 This very small producer in the town of Fulton in Sonoma County was launched by “two kids,” Sara Vaughn and Matt Duffy,who “didn’t really know any better.” Vaughn started out as a harvest intern at Siduri and then spent three years working at the Vinify custom crush facility. 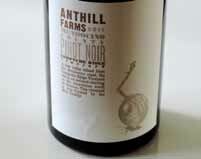 The label was launched in 2009 when the couple bought a ton of Pinot Noir grapes. 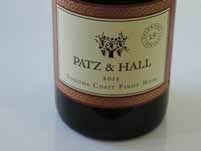 Their first commercial wine was released from the 2011 vintage coinciding with the birth of their first child. The label is eye-catching. agree with Denise that the WesMar wines in this vintage are more feminine with lower alcohols and higher acidity levels. She says these wines will take a little longer to harmonize and will age well in bottle. The percentage of whole cluster was not increased so my perception of more whole cluster spice in these wines is a reflection of the vintage. No wine was produced from Hellenthal Vineyard in 2011 since picking was not an option before the rains because sugars were too low and the grapes picked after the rains did not make the cut. 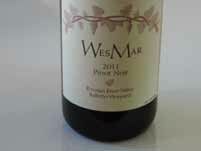 WesMar wines can now be ordered on the winery’s website so I won’t have anything to nag Denise about. These wines received big scores from the Wine Enthusiast but I felt they were very good to outstanding but not extraordinary. 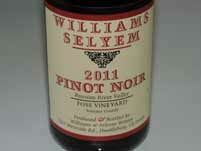 The Williams Selyem wines in 2011 are not big and lush, but very forward and easy to drink with supple tannins and plenty of sneaky charm.